Home Interviews Rockstar Husqvarna MX2 launch – Martens on his talented 2019 squad! 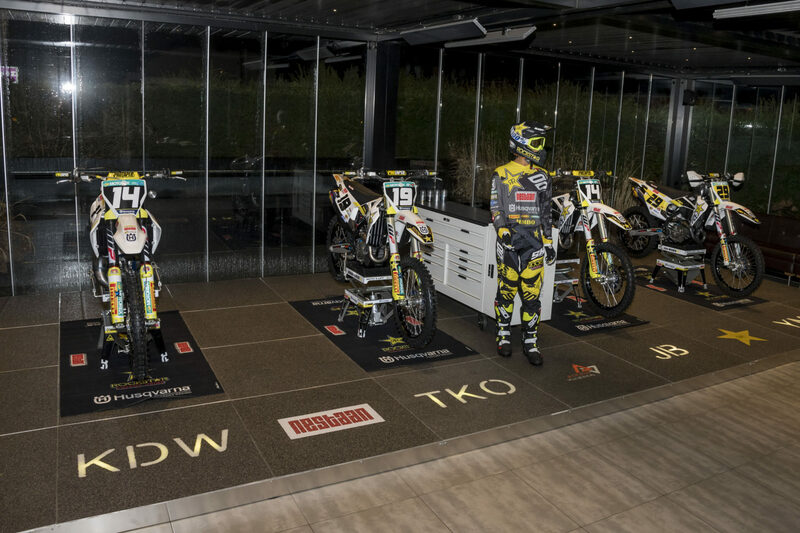 A little over a week before their first race of the season, the Rockstar Energy Husqvarna Factory Racing team was presented to sponsors on Friday night. The pleasant setting of restaurant De Engel in Zandhoven was familiar but the team of Jacky Martens and Kay Hennekens had a lot of news to report! After a long winter staying down in Spain, Thomas Kjer-Olsen and Jed Beaton returned to Belgium this week. Newcomer Kay De Wolf (EMX125) also spent time in RedSand. The focused preparation is an intensive period of the year but team coach Rasmus Jörgensen is satisfied with the winter of his men: “We have trained a lot … and then trained even more! No, seriously we have worked hard physically, but also many hours on the bike. This year the conditions in RedSand were also very good and that helps of course. For Thomas Kjer-Olsen, these experiences are nothing new because he starts his third season with us. Everything is going very well for him right now and he is healthy, which is also very important in this period! “For Jed and Kay many new things came to them, but they too are doing fine. Jed has adapted well to the engine and the team. It is clear that the engine is good and he likes the power. For Beaton the situation is slightly different than for TKO, of course. Last year, Jed had a very bad injury (Beaton broke his left leg in Matterley Basin) so it is a question of building up for him. Building up step by step is therefore the main issue for Jed. Last but not least, team boss Jacky Martens gave his thoughts. “What we saw from the boys in Spain looked very good. That gives confidence, but of course a competition is something else. On the other hand, you really know how the puzzle pieces fall into place! I expect a lot from TKO this year. His preparation went perfectly. In addition, the engine also improved well as Joël (red. De Busser) just gave. Jed has to get used to everything a little bit, but it also looks very positive for him. The potential is certainly there. “Kay De Wolf has almost the same feeling as when we started with Jeffrey Herlings. Jeffrey was also 14 years old when he started with us. We hope to be able to make good progress with Kay as well. What Kay is already bringing, looks very promising. For myself and the team, the setup around Kay also gives a lot of oxygen. Guiding young guests to the top is my thing. I think it will be a very nice season. Also with Yentel it runs smoothly in the beach races. He really lived for his sport and his hard work was rewarded. The end result is unfortunately a bit less but that is top sport. You will be paid for the result at the end of the ride. Hopefully he can now win the Enduro del Verano. “For the GP riders, we are of course optimistic that we have made such tremendous progress. A capital gain of around 20% is of course unusual! You may experience this once every five years or even ten years. However, both communication and cooperation with the Husqvarna factory are exemplary. By testing and refining, there is a very nice product. Next weekend the Husqvarna factory drivers and Kay De Wolf will start their season with the Hawkstone Park International in England.